For Principles of Macroeconomics courses. Questions that drive interest, applications that illustrate concepts, and the tools to test and solidify comprehension. Students come into their first Economics course thinking they will gain a better understanding of the economy around them. Unfortunately, they often leave with many unanswered questions. 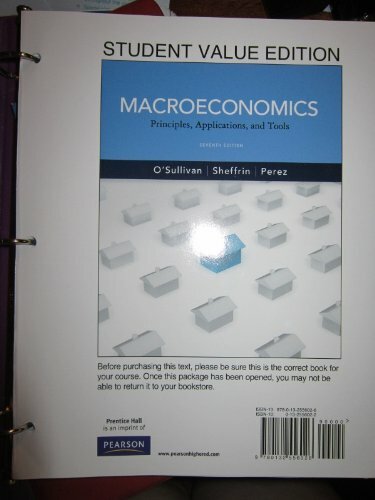 To ensure students actively internalize economics, O'Sullivan/Sheffrin/Perez use chapter-opening questions to spark interest on important economic concepts, applications that vividly illustrate those concepts, and chapter-ending tools that test and solidify understanding. research explores economic issues concerning urban land use, environmental protection, and public policy. His articles have appeared in many economics journals, including theJournal of Urban Economics, Journal of Environmental Economics and Management, National Tax Journal, Journal of Public Economics, andJournal of Law and Economics. Professor O'Sullivan lives with his family in Lake Oswego, Oregon. For recreation, he enjoys hiking, boogie-boarding, paragliding, and squash.Steven M. Sheffrin is dean of the division of social sciences and professor of economics at the University of California, Davis. He has been a visiting professor at Princeton University,Oxford University, and the London School of Economics and has served as a financial economist with the Office of Tax Analysis of the United States Department of Treasury. He has been on the faculty of the University of California, Davis, since 1976 and has served as the chairman of the department of economics. He received his B.A. from Wesleyan University and his Ph.D. in economics from the Massachusetts Institute of Technology. Professor Sheffrin is the author of 10 other books and monographs and over 100 articles in the fields of macroeconomics, public finance, and international economics. His most recent books include Rational Expectations (second edition) and Property Taxes and Tax Revolts: The Legacy of Proposition 13 (with Arthur O'Sullivan and Terri Sexton). Professor Sheffrin has taught macroeconomics at all levels, from large introduction to principles classes (enrollments of 400) to graduate classes for doctoral students. He is the recipient of the Thomas Mayer Distinguished Teaching Award in economics. He lives with his wife Anjali (also an economist) in Davis, California, and has two daughters who have studied economics. In addition to a passion for current affairs and travel, he plays a tough game of tennis.Stephen Perez is chair of the economics department at California State University, Sacramento. After receiving his B.A. in economics at the University of California, San Diego, he received his Ph.D. in economics from the University of California, Davis, in 1994. He taught economics at Virginia Commonwealth University and Washington State University before coming to California State University, Sacramento, in 2001. He teaches macroeconomics at all levels as well as econometrics, sports economics, labor economics, and mathematics for economists. Professor Perez's research explores most macroeconomic topics. In particular, he is interested in evaluating the ability of econometric techniques to discover the truth, issues of causality in macroeconomics, and sports economics. His articles have appeared in many economics journals, including the Journal of Monetary Economics, Econometrics Journal, Economics Letters, Journal of Economic Methodology, Public Finance and Management, Journal of Economics and Business, Oxford Bulletin of Economics and Statistics, Journal of Money, Credit, and Banking, Applied Economics, and Journal of Macroeconomics.